The NIA Annual Open Meeting will take place at the Ionic Centre. 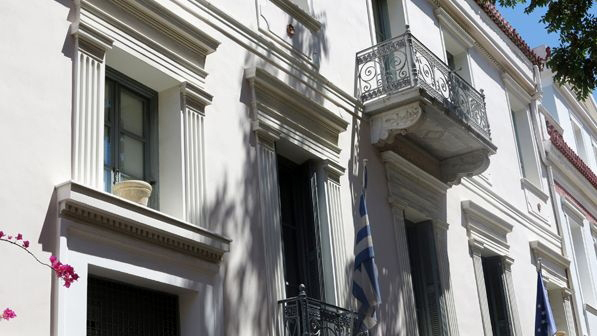 The Annual Open Meeting of the Netherlands Institute at Athens will take place on Friday, May 12, 2017 at 7.00 p.m.
Over the past twenty years, I have studied finds from four survey projects outside the core of ‘Classical’ Greece. This taught me a lot about ancient everyday pottery, methodologies of field work and find processing and various aspects of regional identity in modern Greece. Besides that, and rather to my own surprise, looking at sherds and mapping them, also slowly brought me back to an older hobby of mine: domestic architecture and spatial aspects of settlement. Our views of the ways ancient Greek houses are spread over towns and the countryside, and settlement patterns are integrated into social space seem very much guided by contemporary models. The more I looked at find patterns in many surveys, however, the more I struggled with these models. The rather thin spread of finds in many areas and periods seem difficult to reconcile with the rather dense habitation patterns usually envisaged for both cities and villages/hamlets, and settlements often seem too small or too large to fit in ‘properly’ organized polis or ethnos units. Of course, scholars have long abandoned all too strict definitions of ‘the polis’, but the archaeological grounding of that still remains rather patchy and vague. Can survey perhaps offer some help here? In my lecture, I hope to show that the areas of ancient Halos and several of the Boeotian cities which I have studied over the past years, may offer some relevant new insights. Vladimir Stissi holds the chair of Classical Archaeology at the University of Amsterdam. His research focuses on various aspects of the production, distribution, uses and meanings of Greek pottery from the Early Iron Age into the Hellenistic period and on methods of field work and find processing. He has participated in field work in Greece since he was an undergraduate, and is now co-directing the Hellenic-Dutch fieldwork at Halos and part of the teams preparing publication of the Zakynthos Archaeology Project and long lasting survey work in Boeotia.